Step 1) Visit your primary care doctor for a wellness check-up. Annual well check-ups and related lab work are covered at 100% by your Cigna health insurance plan for all covered members who visit an in-network doctor. At this visit, your doctor may also request routine blood work specific to your age and medical history. All covered employees and dependents age 18 and over must visit their doctor for a wellness visit in order to be eligible for the wellness discount. To verify that you have seen your doctor during the year, have your doctor sign the Physician Verification Form at the time of your visit. Once completed, return this form to HR to confirm your wellness visit. No medical information should be submitted to HR. Step 2) Submit monthly verification of your pursuit of a healthy lifestyle. To receive our weekly $20 health insurance premium discount, we require that all covered members ages 18 and over are actively pursuing a healthy lifestyle. We allow each individual to choose a monthly goal or fitness activity that works for them, whether that be improved eating habits, regular exercise, appropriate water consumption, or even getting enough sleep. If you have a medical condition that prevents you from meeting your usual goal, please contact our Wellness Director Don Lew for suggestions on alternative activities and health-related goals. Even someone recovering from surgery or experiencing a life-changing event like a new baby can work on things such as hydration or daily stretching. For the purposes of this discount, your set goal must be met a minimum of 6 times throughout the month. All screenshots must include a date. To verify this, you can submit a screen shot from an app or website you use to track your goal, or you can submit one of our downloadable training calendars, found below. These goal-specific training plans are created by our Wellness Team to offer an easy way to meet your fitness goals and track your progress. Please send all submissions to wellness@apg.company. We recognize that when it comes to improving your health, sometimes it can be difficult to know where to start. The Wellness Team has designed several fitness plans to help you meet your wellness goals. We will continue to add and expand our plans, so if you have a specific goal you would like to reach, let us know! Our Wellness Team would be happy to create a plan to help you reach your goal. 2019 Exercise Calendar - print as is, or open with adobe reader for an editable version to type in your workouts or other monthly goal. 2019 Whole Food Plant Based (WFPB) Calendar - print as is, or open with adobe reader for an editable version to type in your workouts or other monthly goal. 2018 Healthy Portions Calendar - For those pursuing a goal of a more balanced diet and to control over-eating, you can use this calendar to track portions of different food groups (vegetables, fruits, proteins, carbohydrates, healthy fats, seeds & dressings, and oils). You can use this calendar in conjunction with portion-control color-coded containers, or using the suggested measurements in place of the containers. *** 2019 Version available upon request. Note: The examples below use a Fitbit tracker, but any activity tracker can be used, such as products from Apple, Garmin, Polar, etc. Meet your Fitness Tracker Goal a minimum of 6 times per month. Your goal may be to reach a certain step count (no less than 7,500 daily, although you can set your goal higher than this), or to exercise a certain number of times each week. Below are examples of how to see your goals on a mobile device. ​Here you can adjust all your FitBit goals, including steps, exercise, activity, food, water, and sleep. Click on each goal to view and make adjustments. 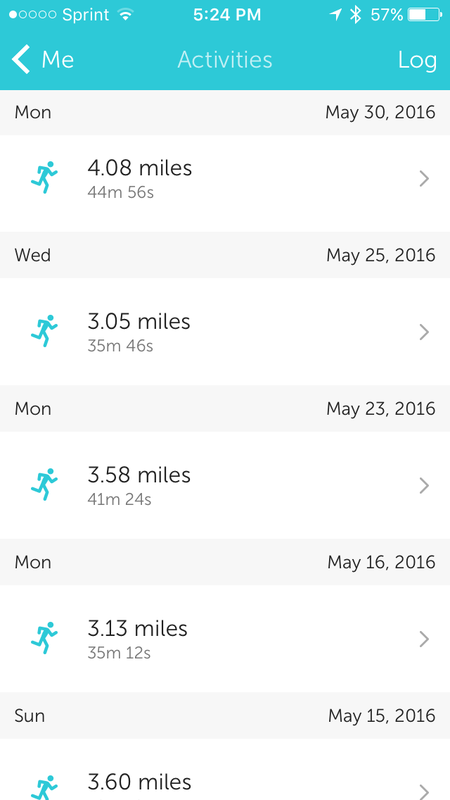 Here are some examples of screenshots you can submit using your FitBit app. Whichever you submit, be sure that it shows you meeting your goal at least 6 times during the month. FitBit Badges are lifetime goals, and should not be submitted as your screenshot for the month. FitBit step count. 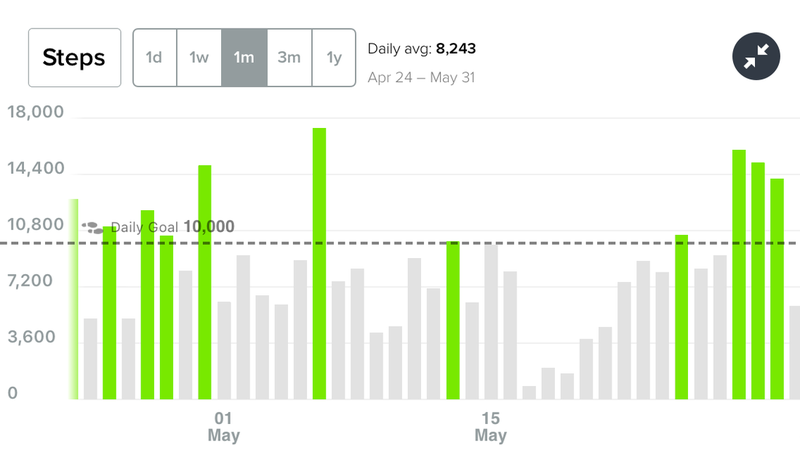 Fitbit designates a goal being met with a green line or a star. While this shot shows a date range that spans more than one month, you can see that there are a total of 6 green lines since the start of the month. Their step count goal was met, and this is an acceptable screenshot. You may need to rotate your phone horizontally to fit more days into your screenshot. You must reach or exceed your personal step count goal at least 6 times in the month in order for it to qualify for the wellness discount. Based on recommendations from the American Heart Association, your step count goal cannot be set lower than 7,500 steps. This may be digital or handwritten, and is an option for those who do not own a fitness tracker or separate app to track exercise. The calendar should show a minimum of 6 completed workouts each month. Track your workouts, runs, walks, swims, or bike rides. Submit screenshots showing a minimum of 6 workouts each month. The FitBit app allows you to log in exercise, and the upgraded models with heart rate capability even have options to start and stop activity tracking and auto-recognition of workouts based on heart rate. Other fitness trackers, such as those by Garmin, Polar, and Apple, have similar features. Some other apps that may be helpful are my Fitness Pal, Map my Walk, RunKeeper, Strava, or MySwimPro. 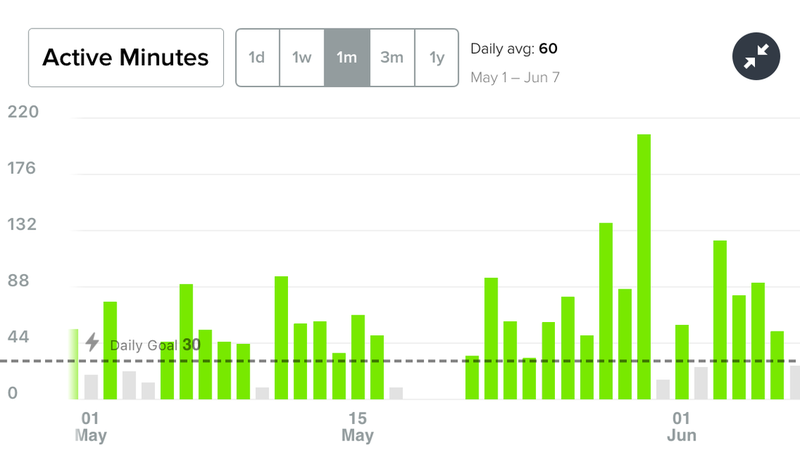 FitBit screenshot showing total active minutes of exercise. Screenshot from the FitBit website showing detailed exercise activity. 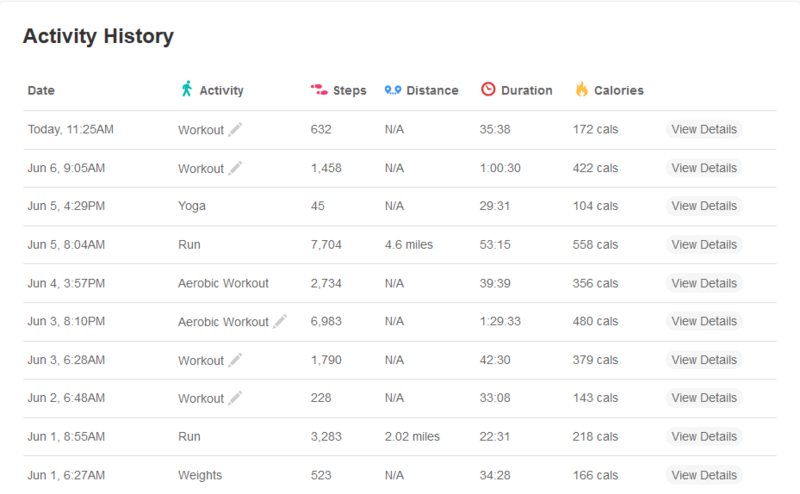 Runkeeper screenshot of activities. May need to send two screenshots if 6 workouts do not all appear on one. Various goals for every fitness level are available on My Health Assistant by Cigna. Log on to myCigna.com, click on the Wellness tab, then click on My Health Assistant tab. Coaches suggest activities to help you meet your goal. Goals can be repeated, or new ones selected. Screenshots should show the date you completed the goal, or if your goal spans more than one month and is not yet completed, the screenshot should show the progress bar with a value of at least 8. Available on iOS and Android, the Coach by Cigna app offers lots of choices for different goals, and gives you daily coaching along the way. The goals vary in length, most between 1-4 weeks. One completed goal meets the requirements for the month. If you want to work on improving your nutrition, you can try an app (or website) like My Fitness Pal or Weight Watchers to track your daily nutrition and caloric intake. Most apps can display Nutrition graphs for an entire week. Submit screen shot(s) showing at least 2 weeks of your activity on the website or app. Participate in our monthly challenges organized by the Wellness Team. We run challenges several times throughout the year. Employees will be notified of a new challenge via email or our monthly Pipeline company newsletter. These Challenges will also be managed on our private APG Facebook Challenge Group. Specifics will be given prior to each challenge on how you can have your participation count as your monthly fitness submission. Your weekly $20 premium discount will be applied the first of the month following completion of steps 1 and 2 as outlined above by the employee and all covered dependents age 18 or older. Please review the Frequently Asked Questions. If you have any further questions regarding this discount program, email HRTeam@apg.company.